I’m really sorry that this took so long. I’ll try to be better next week. 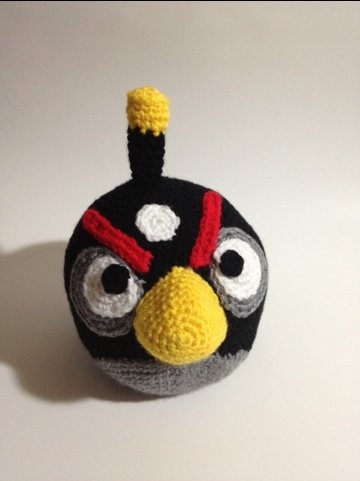 Click through the blog for other Angry Bird and Green Pig Patterns. 6 SC in 2nd Chain from hook. Fasten off leaving a really long tail for sewing. Sew to bottom of bird off center so there is a half circle showing on the front of the bird. Fasten off, leave a long tail for sewing. Sew to top of head. Note eyes are made in three pieces and then sewn together layering them as you go. Fasten off. Sew to center of head. Fasten off. Flatten bottom to make it look triangular. Sew to face between the eyes. Stuff when almost done sewing. This will help it keep the shape. I haven’t gotten that far yet. I’ll post it when I do. Thanks a lit, i like your angry bird very much, and this discription helped me.